Halloween is quickly approaching! My little ghost and goblin are already starting to plan their Halloween costumes, even though they seem to change their mind on a daily basis. And, of course, I’m thinking about how to celebrate this fun holiday. I’m so excited to show you this “Trick or Treat, You’re So Sweet” printable party collection I designed for Halloween parties that are more sweet than spooky. Last week, I styled this party to showcase the collection. 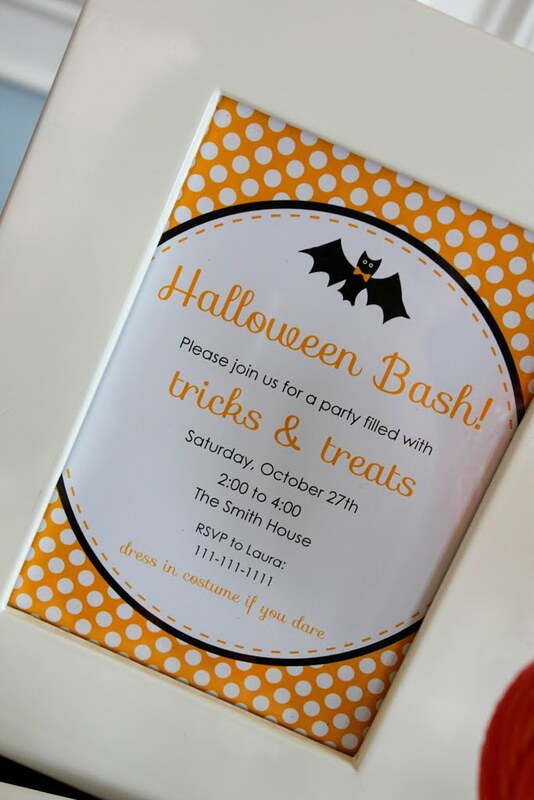 The design started with the polka dot invitation. 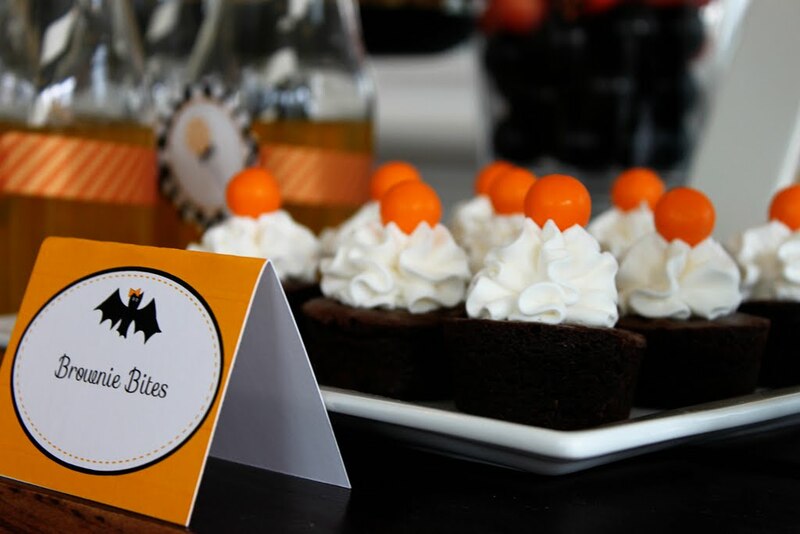 The little bow tie wearing bat and polka dots set the tone for a Halloween Bash filled with sweet treats. Most of the desserts for the party were purchased at my local grocery store. 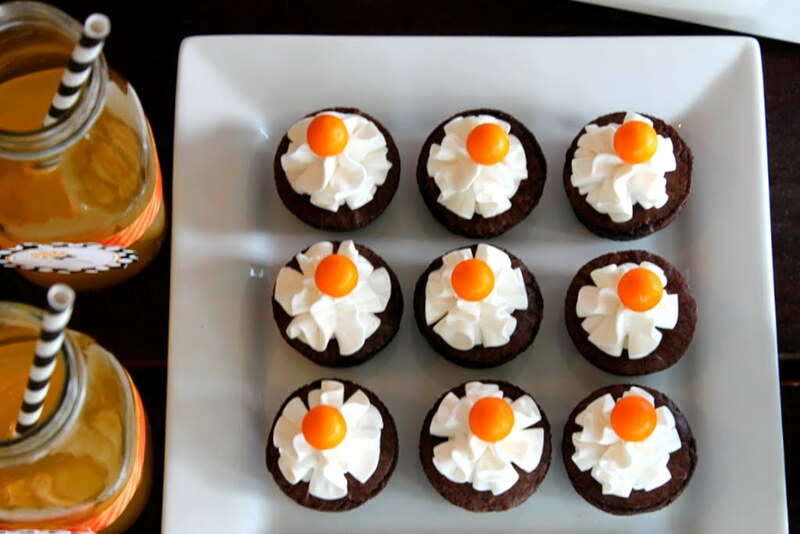 To make the Brownie Bites, start with purchased or homemade brownie bites. 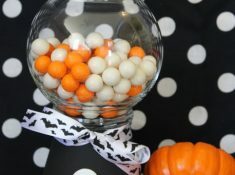 Then pipe store bought or homemade white icing on top and garnish them with orange gum balls. These easy one-bite treats were delicious and simple. 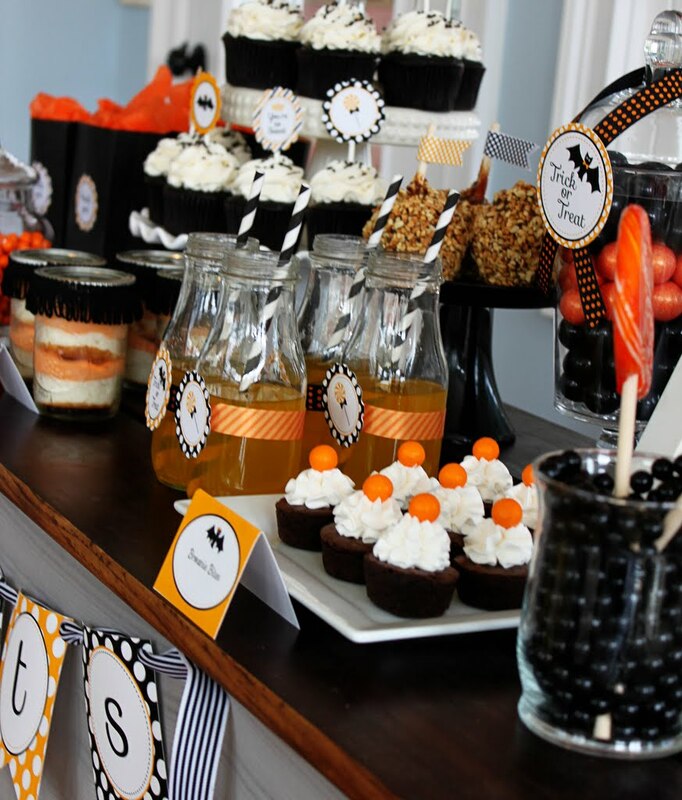 Plus, they added a pop of color to the dessert table. 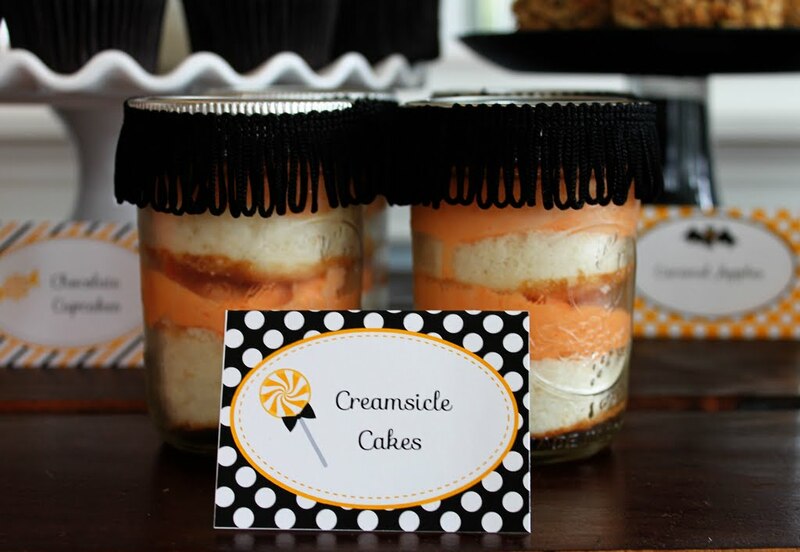 The Creamsicle Cakes were made portable by putting them in mason jars. 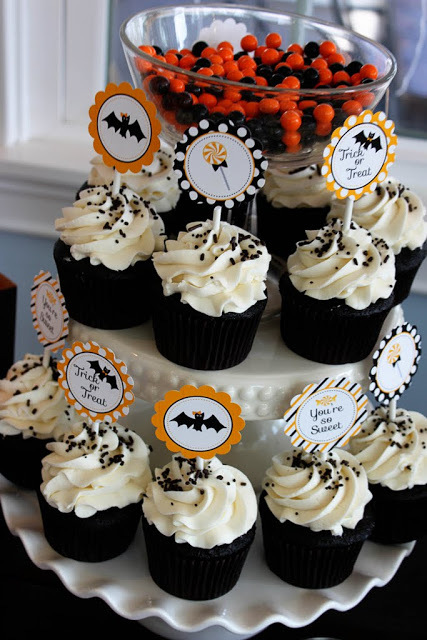 Since they are portable, guests can either enjoy them at the party or take them home as a favor. To make these layered cakes, simply bake a white cake on a large cookie sheet. Using a round cookie cutter, cut them to fit in the jar, layering the icing between the layers. A little bit of black trim from the fabric department embellishes the ordinary mason jars. 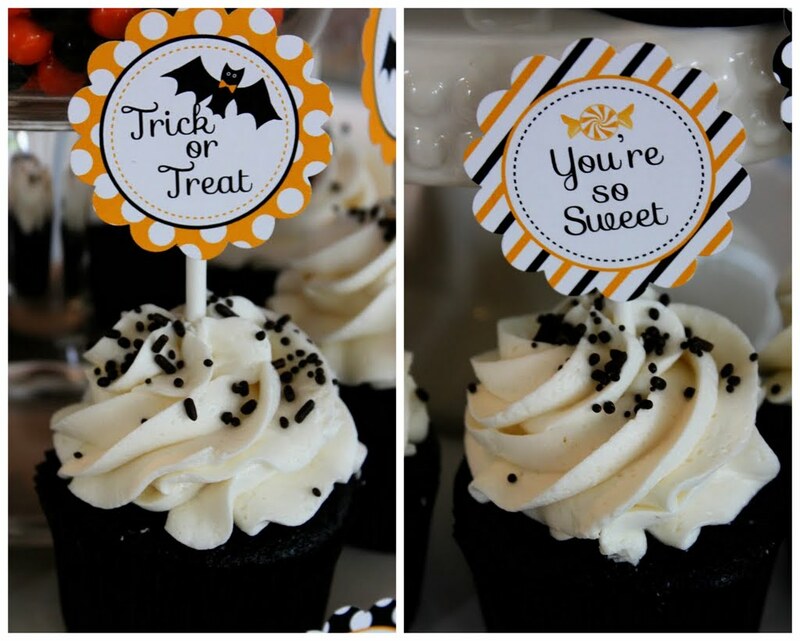 The party circles from the Halloween Collection topped cupcakes from my favorite local bakery, The Twisted Sifter. I stacked two cake plates and an antique compote bowl with Sixlets to create height and interest on the table. 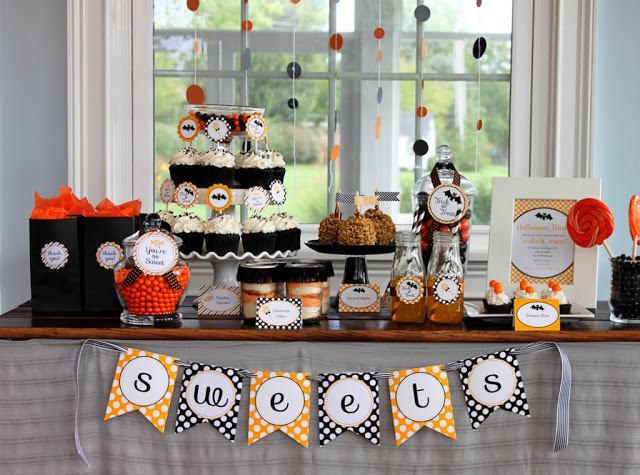 The Cupcake Toppers include a black and white polka dot lollipop design, orange and white polka dot bat design, solid orange bat design, and diagonal stripe candy design in orange and black. 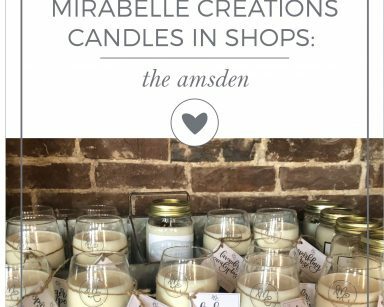 To view all of the designs, please visit my Etsy Shop. 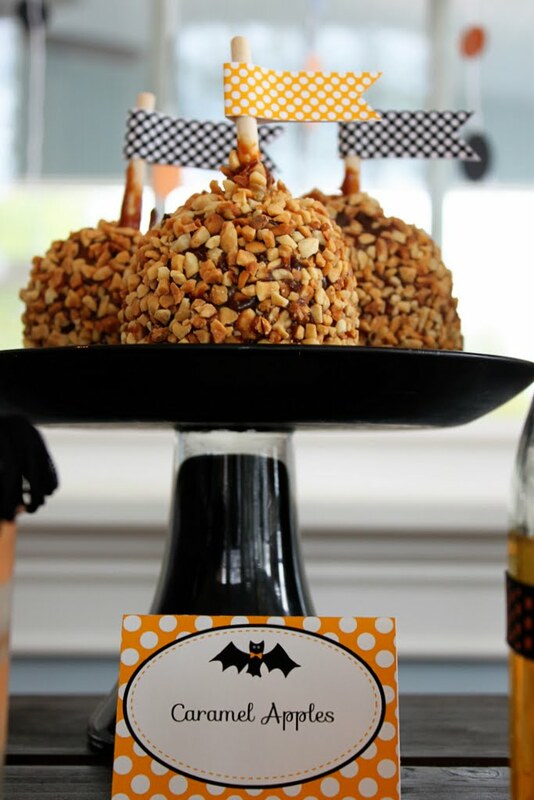 Caramel apples are a must-have at any fall party! These caramel apples were store bought. 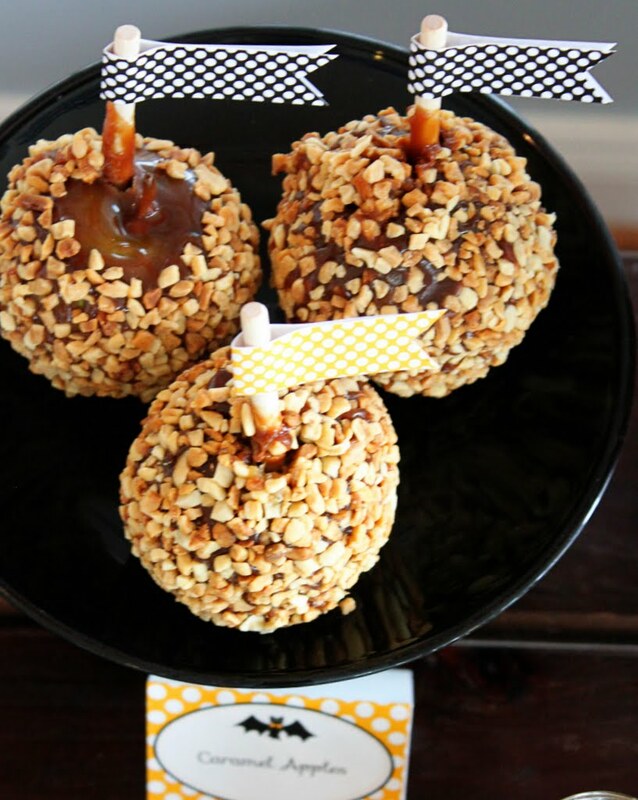 Have you ever tried to make your own caramel apples? I recently tried and it was an epic failure! The homemade caramel tasted fantastic, but it slid right off the apples. If you have any great caramel apple tips, I’d love to hear them! I used the drink flags from the Halloween Collection to decorate the caramel apple sticks. The apples sat on a black cake stand that I made last year. 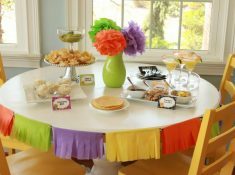 An easy way to make a cake stand in any color is to first purchase an inexpensive glass stand. Using the paint color of your choice, paint both the underside of the top and the inside of the stand portion. 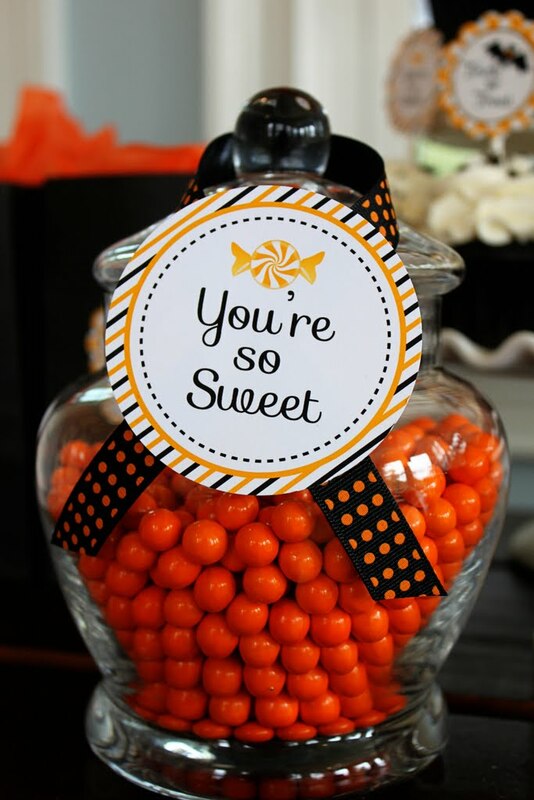 Apothecary jars filled with black and orange candy added color to the dessert table design. 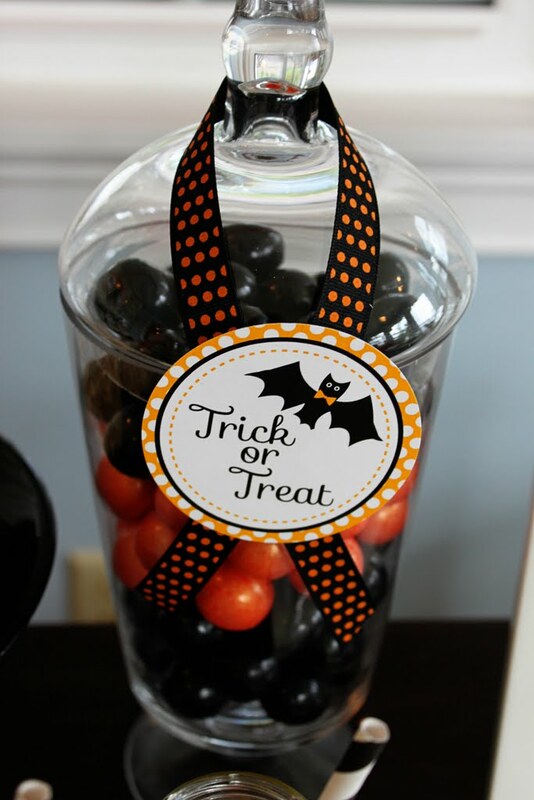 The 4 inch circles included in the Halloween Collection were attached to the outside of the jars. The glass jar was filled with black Sixlets, so the giant orange lollipops would stay in place. 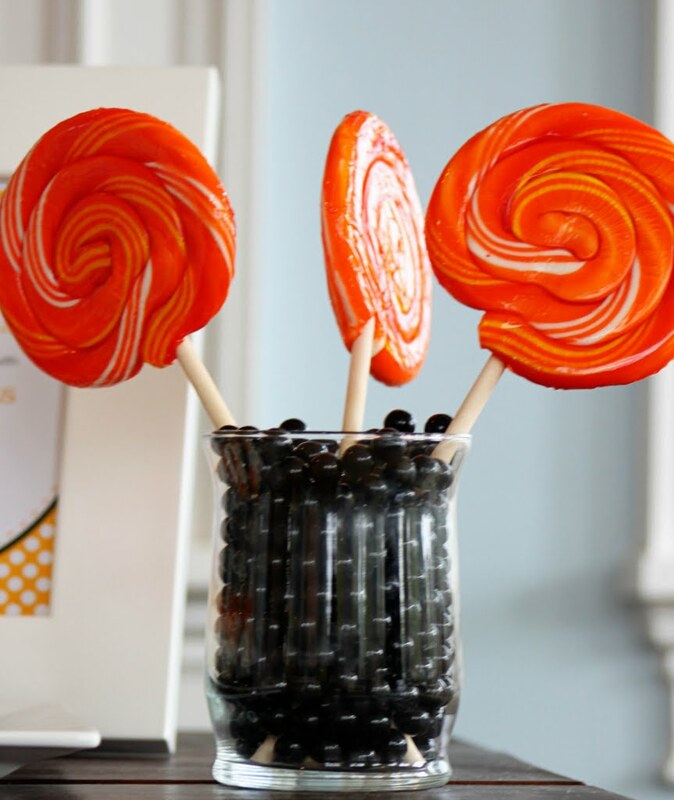 Of all the candy on the table, these lollipops were my son’s first choice. These glass bottles were filled with clementine flavored Izzes. 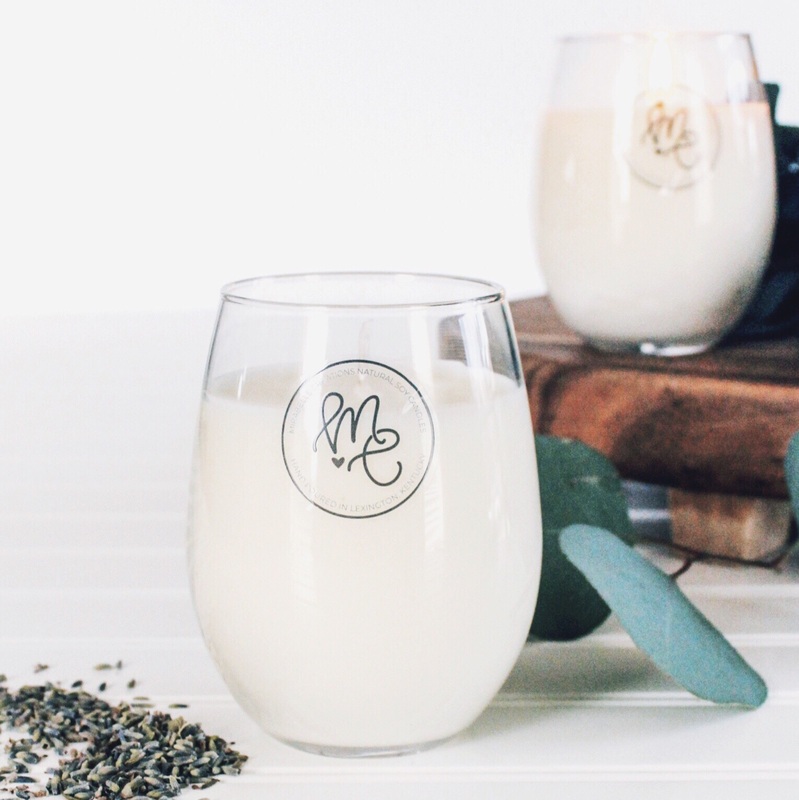 This is by far my kids’ favorite special occasion drink. The glass bottles are recycled Starbucks Bottled Frappuccino Drinks. 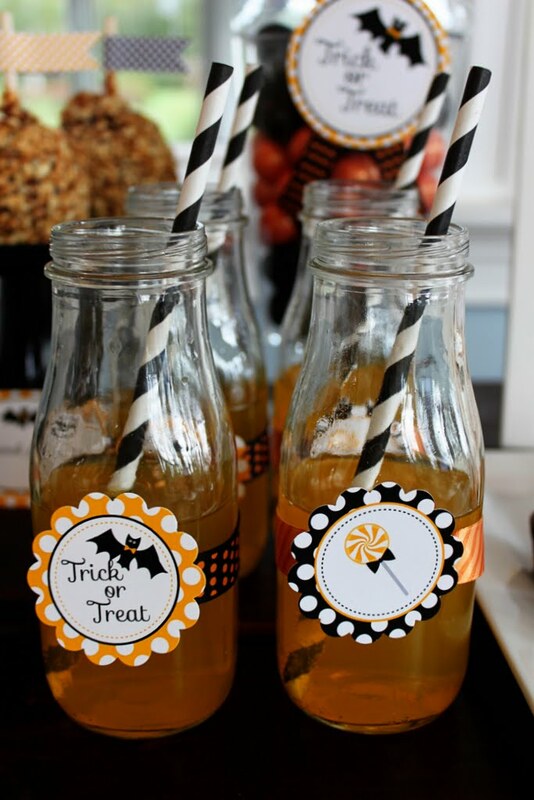 The bottles were decorated with ribbon, a party circle, and striped straws. 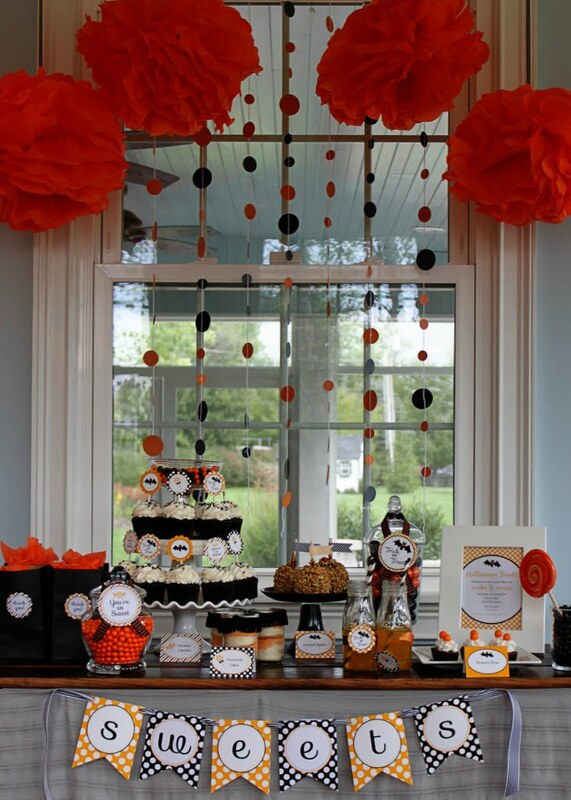 To complete the party, paper goods were used as decorations. First, I hung paper tissue pom poms and circle garlands made from scrapbook paper. 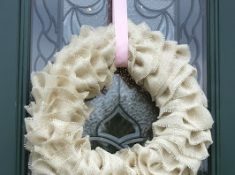 These inexpensive elements provided a festive feel to the table. 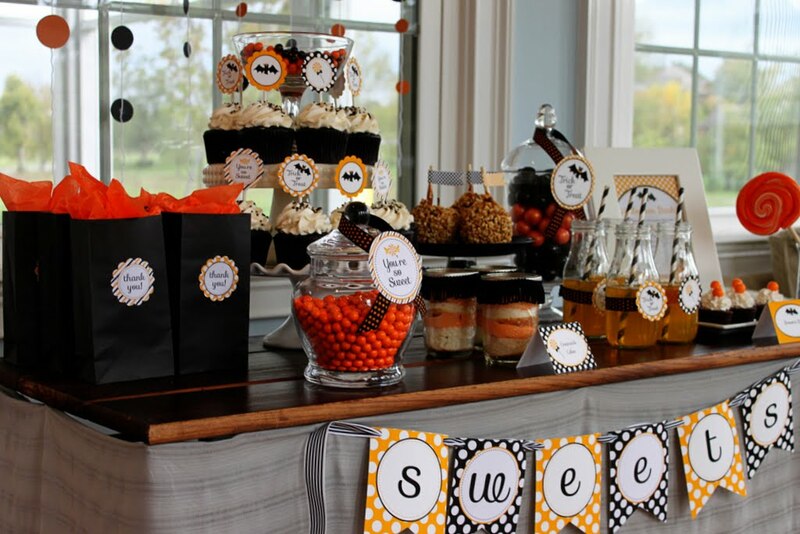 To the front of the dessert table, I added the “sweets” banner from the Halloween Collection. 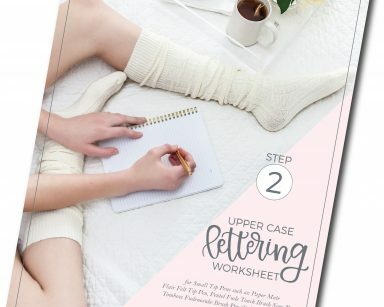 THE PRINTABLE COLLECTION IS NOW AVAILABLE HERE! The Collection is now on sale for a LIMITED TIME ONLY! Those labels on the glass bottles are so cute!